gamification | On Your Marks! Warning, folks: This is a long post detailing how we used SCVNGR for On Your Marks! If you’re keen to learn more, read on. As part of my Master of IT (Library & Information Science) studies at QUT, I recently conducted some research on gamification based on Information Programs, a unit taught and created by Kate Davis. Kate gamified the class for one week, and the results were pretty spectacular. Engagement trebled, the learning community was enhanced, students learned about gamification, and emotions ran high, still many months after the class finished. Kate and I thought we would ‘do different’, and submitted a proposal to gamify the ALIA Information Online conference, based on what we had learnt from Information Programs. I also looked at what others had done, both in libraries and conferences, and got in touch with Eli Neiburger of the Ann Arbor District Library, and Zac Fitz-Walter from QUT. Zac is doing his PhD on gamification and mobile apps and was involved with State Library of Queensland’s Secret SLQ. The AADL Summer Game is run on Drupal, which is open-source and can be found here: http://github.com/aadl We considered using Drupal, but it was going to be too time-consuming, labour-intensive and complex for us. Secret SLQ is an iOS app that was designed specifically for State Library of Queensland, and we didn’t have the time or budget for that. We also didn’t want to exclude Android users. Information Programs had used WordPress with a number of gamification plug-ins. This, together with Twitter, was an option, but it required a lot of manual intervention, and couldn’t do everything we wanted to do for such a large conference. So we went with SCVNGR. SCVNGR is a location-based mobile app which allows players to complete challenges, earn points, unlock badges, and receive rewards. Sounded perfect! Not quite. SCVNGR entitles you to 5 free challenges, and we wanted more. So we wrote to them and asked if we could have 10, and they said no. So I figured out something sneaky. We could use the 5 free challenges, deactivate them at the end of each day and activate 5 new challenges the following day. It was risky. We weren’t sure if SCVNGR would go for this, but it was within their terms of service, so we crossed our fingers and hoped it would work. This bit did. By creating a colour-coded number for each challenge, I thought it would be clear which were the ‘officially-sanctioned’ challenges. What we didn’t realise is that any player could simply add their own challenges. We thought this could only be done in the ‘builder’ mode of the app. This was wonderful – it certainly increased engagement, but it added to the confusion. Which were the ‘real’ challenges? We put up the challenge key on the website and for Days 2 and 3 of the conference I explicitly outlined the core and bonus challenges. When initially creating the challenges we found that anyone could add challenges to any old place. As a matter of fact, anyone could just delete a place. This struck us as a bit odd, and I think it is one of the biggest flaws in the SCVNGR app. If you knew what you were doing, it would be quite easy to sabotage an event or business. This was very risky, but we didn’t think (we hoped) anyone would figure out how to do this or be inclined to do so. The rewards were also tied to the place, so if I owned a café, for example, I was entitled to offer a free coffee for anyone who earned 10 points. SCVNGR has to determine if you are entitled to offer these rewards however, and one month after contacting them, they are still to get back to me with approval for our reward, the chance to submit an entry to win that iPad mini. We got around this by creating a challenge around actually submitting the entry, and by explaining the rules on the website and video. But still players were confused. The SCVNGR app also comes with its own challenges: Check-In, Social Check-In, Say something and Snap a picture. The rules of On Your Marks! stated that the qualifying challenges appeared below these four, but many participants enjoyed completing the SCVNGR challenges also. The only problem was, when something went wrong, it was out of hands. We didn’t expect people to get so excited about earning points and getting cross when they didn’t, but experience should have told us that if there’s a competitive element on offer, some people are going to get very competitive! The SCVNGR app also allows you to complete challenges more than once, so players were confused when, having already completed a challenge, the challenge was still present. Points were sometimes added, sometimes not, and players were getting stressed out. The biggest glitch with SCVNGR was the ability to ‘flag’ a challenge. Flagging a challenge sends an alert to SCVNGR that there is a problem, and the challenge automatically gets blocked. It is quite easy to accidentally flag a challenge and others thought that flagging meant ‘liking’. So our challenges were disappearing! Once we discovered this we were able to create new (or duplicate) core challenges, but this could not be done for those challenges created by players. Another drama occurred when someone flagged our location, thus blocking the entire event! We were able to rectify this by creating another (identical) location, adding the challenges, and informing players not to ‘flag’. This is the biggest glitch in the SCVNGR app, and was the scariest thing for us behind the scenes. SCVNGR provides the capacity to score on a leaderboard, however this is ‘friend’ based, not event-based. The leaderboard shows where you rank compared to your friends. If you could get everyone participating in the event to become friends, the leaderboard would take care of the rest. We had to do it manually, recording everyone’s activity in the core and bonus challenges. We abandoned the idea of a leaderboard pretty quickly because of confusion over the points, and also because it truly did grow too big for itself! We also wanted to eliminate the competitive element and provide everyone with the opportunity to win the prize. But where there are points there is competition! To gamify or not to gamify? It got messy, it was extremely busy behind the scenes, and a few people got frustrated. Most who played On your marks! had a blast however, and our objectives of engaging delegates and informing them about gamification were met. It wasn’t perfect (difficult for us librarians to accept! ), but it was a success. So bear this in mind when adopting gamification in your own organisation. How competitive did you get? What motivated you? To what lengths would you go to win? Players will ‘game the game’. The competition will grow fierce, people will be disappointed. But what will they gain? Engagement, knowledge, enjoyment, community? Off you go! It’s your turn. Filed under gamification, On your marks! Trove’s Text Correctors Hall of Fame is an early adopter of gamification. The leaderboard recognises those who correct the mistakes of the OCR (Optical Character Recognition) software of Australia’s digitised newspapers and magazines, contributing to this invaluable resource. 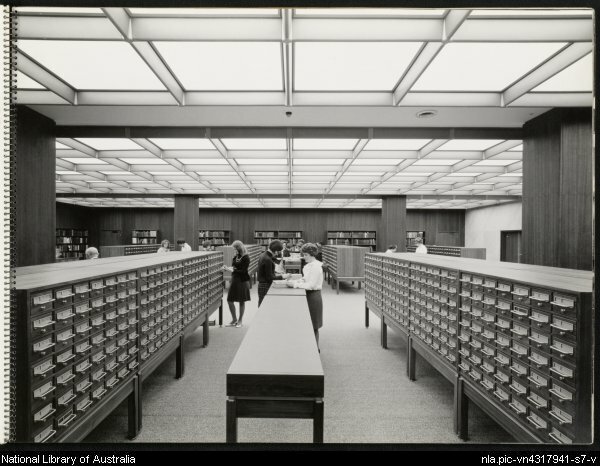 Here’s a challenge: can you make it to the top 100 Trove Correctors Hall of Fame?